Elk Falls is the most impressive waterfall from a shear volume standpoint that I have visited in NE Tennessee/North Carolina border area. It's impressive. Greg Plumb gives it 4 out of 5 stars. I have to agree. The WOW Factor is up there at a solid 8. Even better, the falls are easy to reach. In the parking lot, my GPS said I was 0.13 miles away. The coordinates for this waterfall were updated from my GPS but only varied slightly from the published numbers. You can hear the falls as soon as you get out and its location is inherently obvious. The plunge pool is extremely large and certain to be busy in the summer months. Downstream of the pool are a couple of short (~5 ft) cascades before the river levels out. 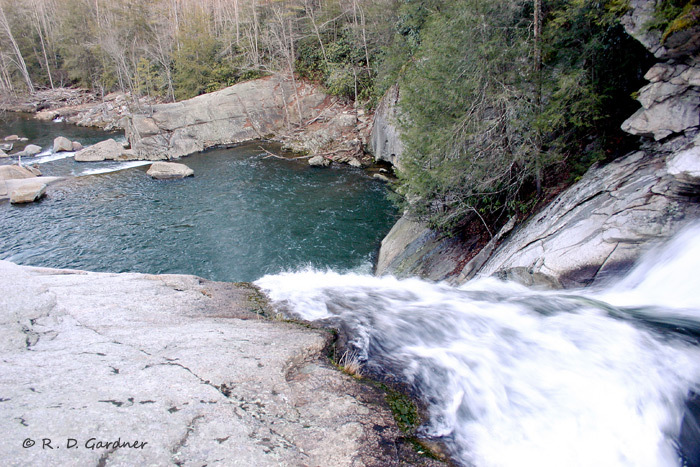 Farther downstream is Twisted Falls, another impressive waterfall that I will be visiting soon. Note that topo maps identify waterfall as "Big Falls" and not Elk Falls. They are one and the same. This waterfall is easy to find. Traveling east on U.S. 19E, look for a sign just before entering the town of Elk Park. The sign is brown with white letters, on the left side of the road, and says "Elk River Falls". Turn left at the sign onto Old Mill Rd. Continue on this road for about 1/4 mile and turn left onto Elk River Rd. Follow this road to the end (just over 4 miles) where there is a parking area. There is one slightly confusing spot where the road appears to "Y" at a one lane bridge (there is a sign for the bridge). Bear right on the main road at this spot. 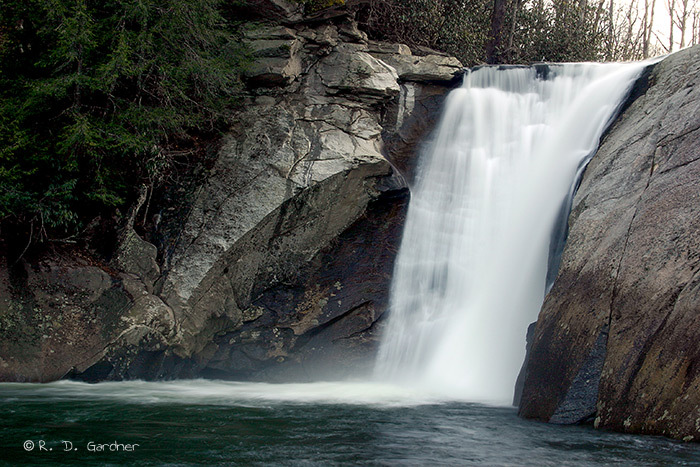 Use the following link to customize your own directions to Elk Falls. Hike? What hike? This is a little stroll, not a hike. There is a small hill to climb as you approach the top of the falls, and of course you have the vertical distance down to the base of the falls for the best view with the trail being a littler rougher. Here is the elevation profile for the hike. You can see it isn't much. The trail is marked with yellow blazes but you aren't going to have any problems getting lost. I was at Elk Falls in late February. The day was partly sunny and I purposefully arrived later in the day, around 4:30 pm or so. Other than the obvious lack of foliage, the conditions were decent. Because it was winter time and I was facing mostly south to take the pictures, the sky was still too light and that hurt some. Try to compose the sky out of the picture if you can. During summer months when the sun sets farther north it won't be as bad. You could also get there early. That would be best. 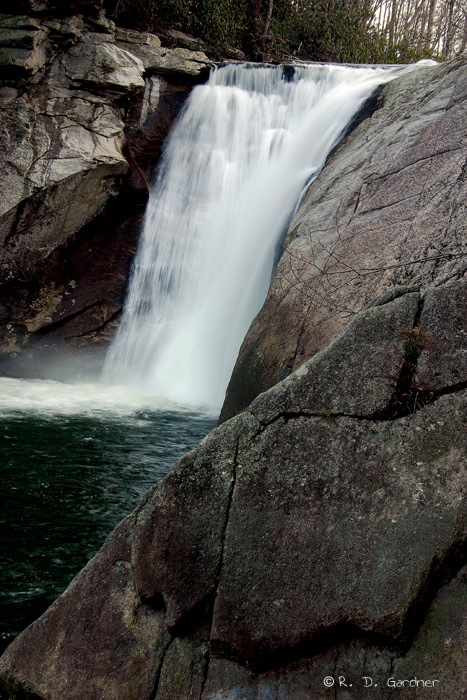 The falls are open and exposed so mid-day shooting won't be effective unless it is really cloudy. Even then you will have the sky with which to contend. The primary picture above was taken just to the left of a large boulder on the right side of the river. In this case I think the horizontal format works well. I used a polarizer which helped reduce the glare on the rock face. And as always, a tripod is a must. 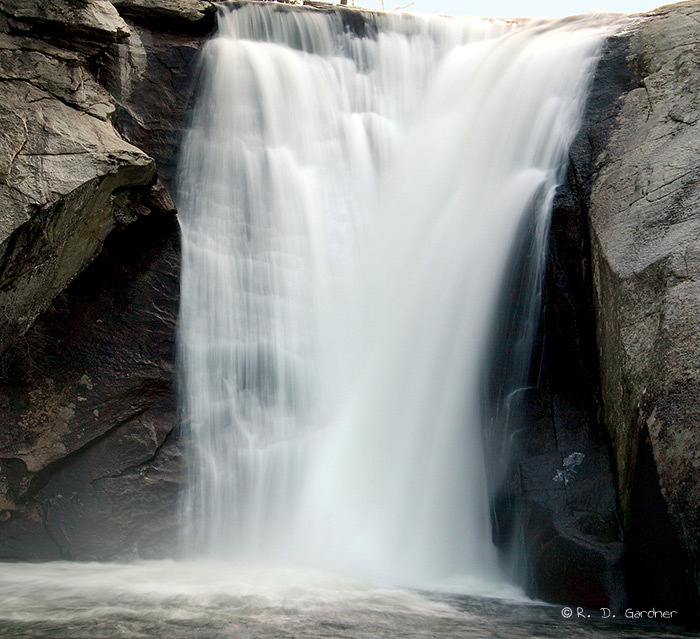 Speaking of which, this waterfall lends itself to a variety of shutter speeds. As always it mostly a matter of personal taste or preference. 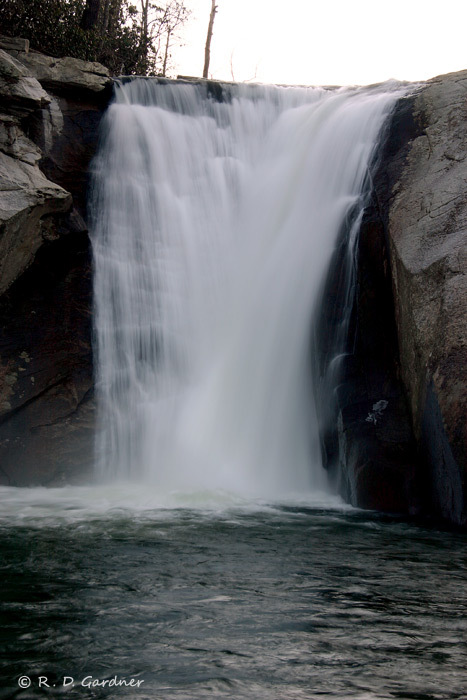 For this particular waterfall, you can see the effect of shutter speed on the camera tripod page. There is also a nicely placed boulder almost directly in from of the waterfall that is easily accessible. I took several shots there but there is no good way to eliminate the ugly sky from this angle. Being winter, I did not venture to the far side of the stream to access possible shots. It appears to be promising for early morning pictures. Soon, very soon. Until then, check out my other waterfall videos on Youtube.